BUBBLY POOL, Jost van Dyke, VI - The make shift garbage dump that emerged following the Hurricanes of 2017 on Jost van Dyke, in the Virgin Islands (VI) became engulfed in flames last evening, August 21, 2018, as contracted workers attempted to begin clearing the garbage to be removed from the island. Virgin Islands News Online has since learnt that a contract was given out by the Recovery and Development Agency (RDA) to M. Ashley Ritter, of Sand-wise Heavy Equipment Limited, to remove the garbage to Tortola, by way of barge and trucks. 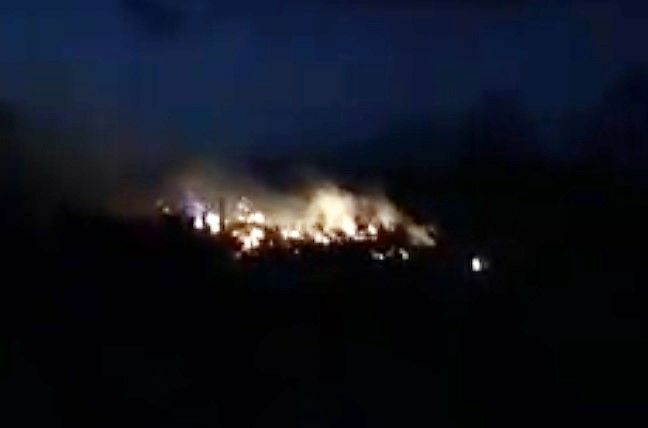 According to reports, the company’s equipment and workers began removing the garbage during the course of the day, but by evening, the dumpsite caught ablaze, forcing workers to abandon the venture. This publication was told there is no fire service on the island and that the blaze continued throughout the night. Reports indicate that the fire, by today, August 22, 2018—though significantly smaller and with less intensity—continued to burn, with plumes of noxious and likely poisonous fumes being injected into the atmosphere. By noon, the fire had been almost completely extinguished. Director of the Department Waste Management, Mr Greg R. Massicote, has since told Virgin Islands News Online, the employees attached to the contractor removing the waste have denied starting the blaze. Some residents have expressed concerns over the initial decision to remove the waste to Tortola, since there is a significant amount of swamp lands on Jost van Dyke, where the garbage could have been used as an aggregate, in building up the already limited land space available on Jost van Dyke. I want to know what these people will tell God on that great judgment day. To this very day I am still here sneezing my head off..nostrils completely blocked. Not a sole to complain to. They claim they cannot get the Cox heath blaze/smoke out up to now. Some days I just lay and weep silently. I had intentions of voting, but now I really don't care anymore!!! I am just too tired and drained.